My son and his lovely girlfriend are away at college, currently in their junior year. 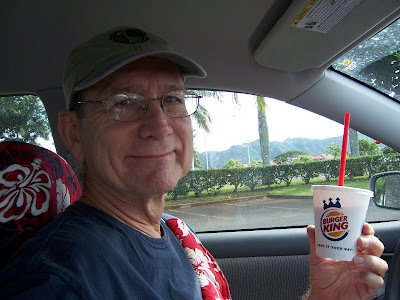 My son Grayson has lived on Kauai most of his life and his girlfriend was born and raised on Kauai. They've known each other since they were very young and started dating when they were sophmores in high school. 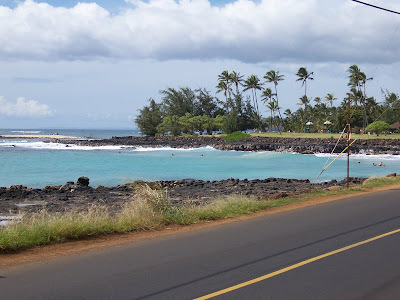 It was a big surprise to us when they announced to us (as high school seniors) that their college of choice was not on nearby Oahu, but in the cold, cold Northwest! Where it snows! But they've lasted and thrived and LOVE their school, even though it's taken some effort to get used to the cold. (Oh, how I love Flat Rate boxes, don't you?) 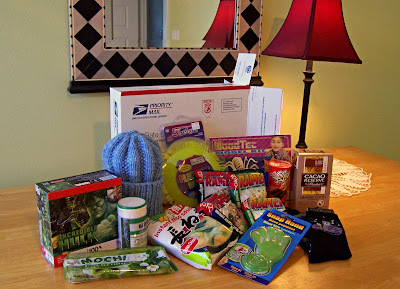 Hot drink packets, ramen, dorm food, silly toys and games, socks, hats, scarves, etc., to keep them warm and mildly amused. My son's favorite color is green, so that's a frequent theme. The pattern was in Paton's "Street Smart" booklet, the same pattern book as my "Must Have Cardigan." 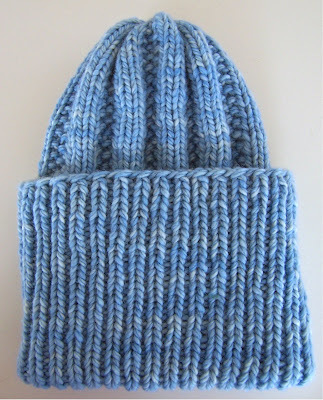 I knitted it using two strands of super-soft Malabrigo. 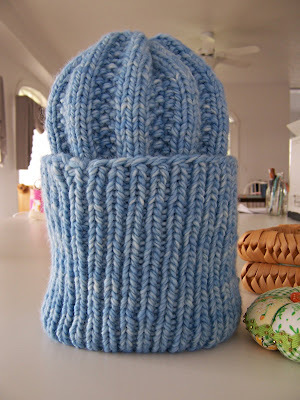 This hat took almost two skeins of Malabrigo! It's quite a thick hat...and very long! 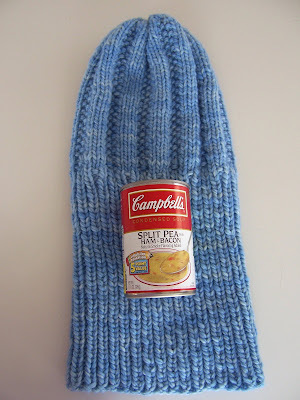 The long part folds up over ears for extra warmth. Let me tell you, I am so in love with Malabrigo! This was my first experience with it--I mail ordered it after I heard other people extol the virtues of this stuff. I was not disappointed. I think it's my favorite yarn EVER. See? It's so thick and lovely, it stands up by itself. I hope she likes it! I think it will look nice on her, don't you? She's such a lovely girl. I couldn't have chosen a better friend and girlfriend for my son. 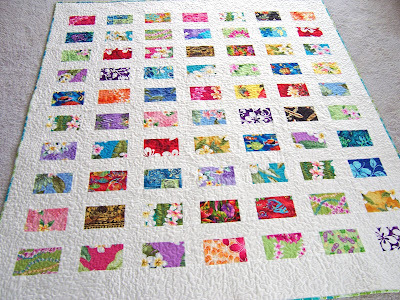 And she helps me quilt!!! I know it's a cliche, but it's like I gained a daughter. One who likes to sew! I am very lucky...oh...and I guess my son is, too. 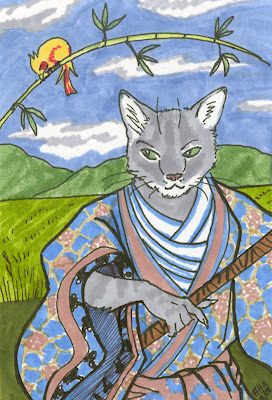 He looks handsome in his Japanese setting and garb, don't you think? 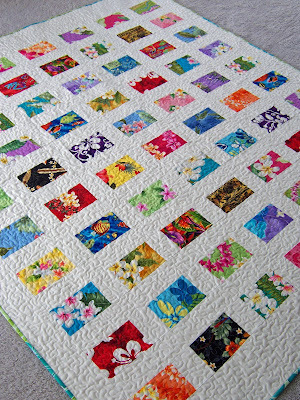 That was a nice quilty break. Did you get your postcards mailed? Let's continue our trip, shall we? 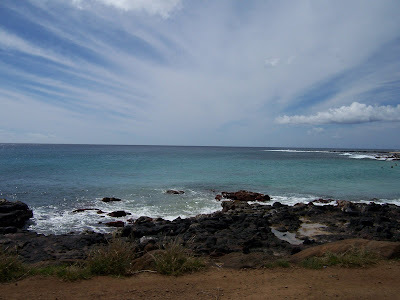 We've arrived at Poipu on the south side of our island, and we're watching Spouting Horn blow. I wish I could insert an image for scale here, because this thing is BIG, although it's hard to tell from this picture. Several stories, high, I'd guess. 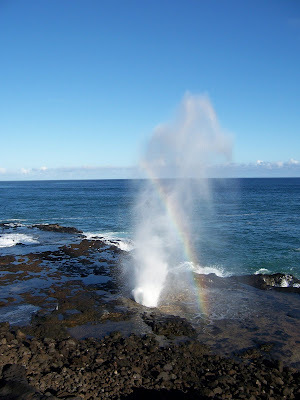 It spouts every few minutes, depending on the wave action from below--sort of like our version of Old Faithful! There's always a rainbow in it, at least when I'm here. An occasional whale swims by in the background, and it is awe-inspiring to watch. This is February, so there are lots of whales out there today. Sorry, I couldn't get a good picture of one...you never know when they're going to breach or spout. They don't come when you call, either. 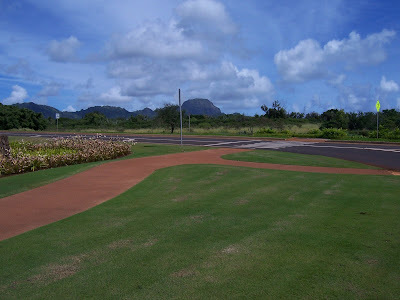 Nice new roads. There's a lovely sidewalk and a little sales office...but nothing else for miles around! 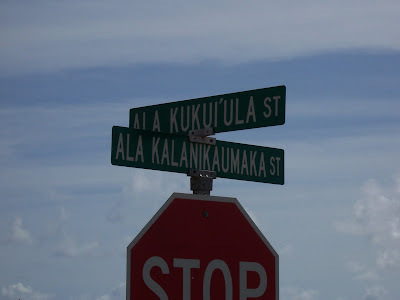 We're on the corner of....uh...Ala Kalanikaumaka and Ala Kukia...no...Kukui'uu....um....maybe it wouldn't be such a great place to live. You'd never be able to fit your address on a standard size mailing envelope. 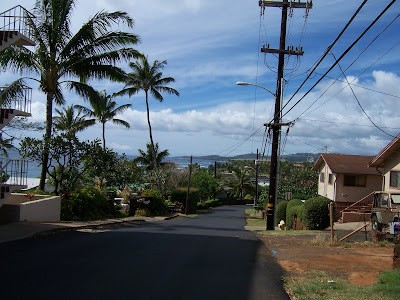 Let's continue down these new roads and work our way down to the beach. Here it is! 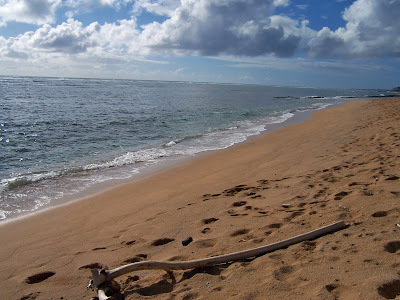 The beautiful warm ocean at Poipu. Ready for a swim? There are only a few people out today enjoying the waves. My lunches are a little too exotic for my husband. He prefers to have it more "his way:"
He's not a big fan of fish and seaweed and other things he can't identify. I think it's the Nebraskan in him. He'll sip his strawberry shake as we head home. 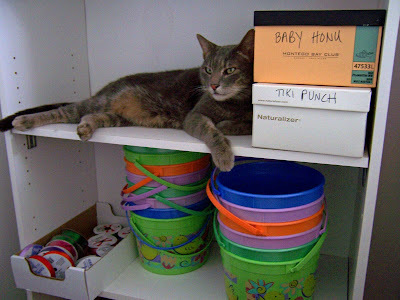 Back home again, where Mr. Bigglesworth is waiting for me to get to work making patterns and tying bows. 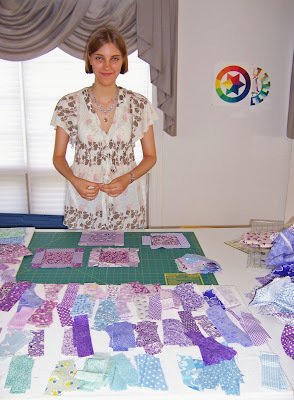 I have quite a few pattern orders to go out--I better get busy! 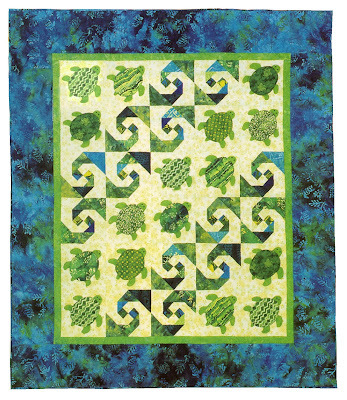 My "Baby Honu" quilt appeared in the latest issue of McCall's quilting magazine and I've been busy with orders for a couple weeks now! It makes me smile to think of my little Honu swimming all over the world. Back to work for me. I hope you enjoyed your Hawaiian vacation; let's do it again soon. Simply This, That, and the Other's Jodi! Congratulations, Jodi. You were selected by a random number generator out of 124 entries (after eliminating duplicates and adding email entries). Thanks so much to all those who entered--I wish I could send a prize to each and every one of you! It was fascinating to see where you all live (brrrr! and ahhhhh....) and what the day was like for you. I loved hearing about what you were cooking (or where you were going out to dinner), what you were sewing, and what your job was like, etc. Everyday life is fascinating, don't you think? I enjoyed all your comments so much! 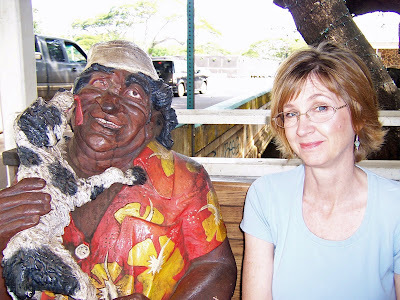 Postcards from Hawaii...and a Giveaway! We've been on vacation now for a few days. Are you missing your friends at home? We should send out some postcards, eh? Postcards from Hawaii! 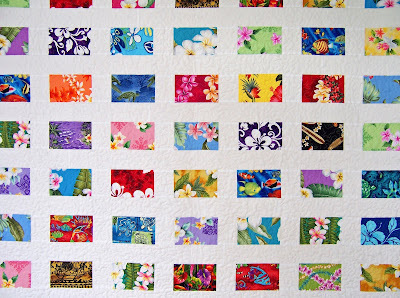 I'd like you to meet my latest quilt, "Postcards from Hawaii." 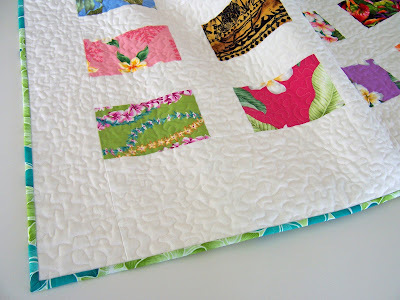 I wanted to make something very simple and modern-looking with lots of white and lots of quilting. 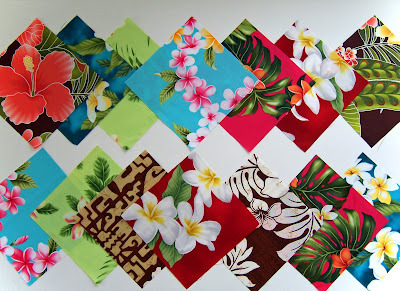 I already had these colorful Hawaiian print 4X6" scraps leftover from a fabric postcard class I taught, so I thought I would sash them up and see what happened. The texture shot. I wanted lots of simple texture, so I machine-meandered with my Bernina using white Bottom Line thread on top and bobbin. I haven't stippled in a long time! 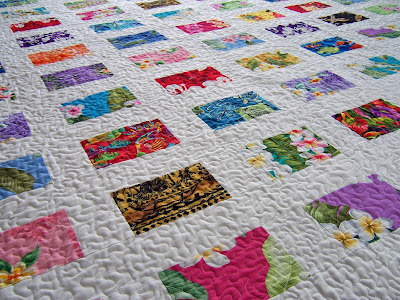 It was relaxing not to have to worry about elaborate quilted daisies, chicken heads or vines. I love how these postcards all work together. I didn't fussy cut a single one! They're not all centered and fussy--I like that. Such pretty colors in these prints. 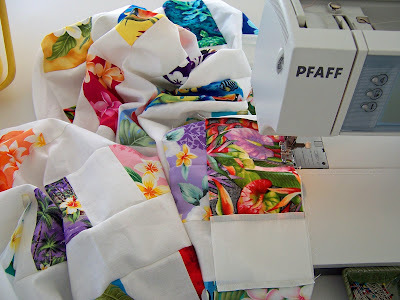 The sashing fabric is Kona Cotton "Snow." It's not exactly white--it's a creamy white. I think it makes the white-white in the postcards sparkle. 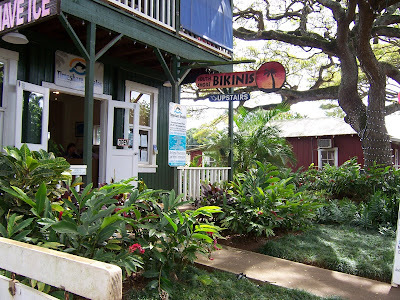 Plumeria, surfboards, Birds of Paradise, fish...everything you'd find on a postcard from Hawaii. 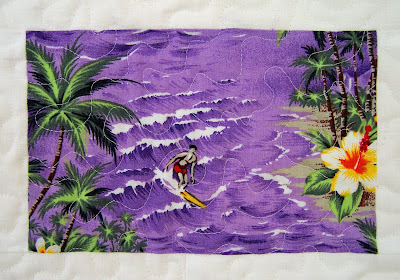 Forever surfing on a purple wave. I love him! I love this print! Do you like it? 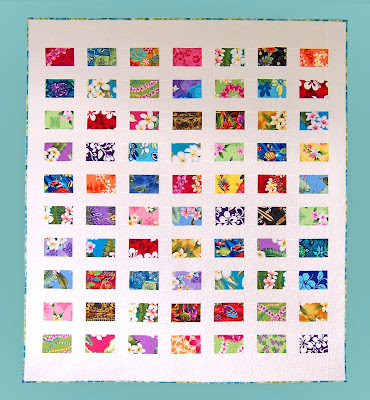 And I'll throw in these charm squares, too, for a little MORE color. Leave me a comment on this post telling me who you are (your web name is fine), where you are, and what you are doing today. 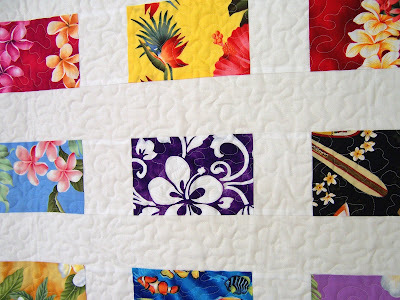 Something like: "My name is Lisa, I live on Kauai, and today I'm knitting a green and red sock, making chicken chow mein for dinner, and writing a blog post about my new quilt." Make sure I have a way of replying to your email. 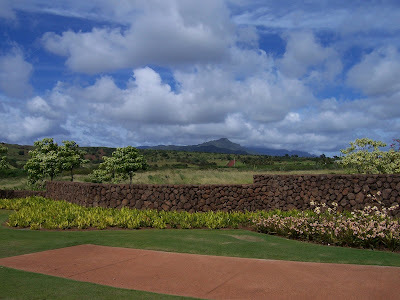 Our trip to Poipu resumes on the next post. Good luck! Edited on February 18th, 2009 to add: The drawing is now closed. Thanks for all your comments! Whaaa??? Did I doze off, sitting on the porch in the warm sun? 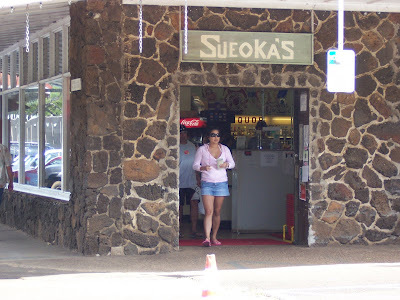 Where the....oh yes...we're in Koloa Town, aren't we? Let's continue our walk. Yep. It's a chicken. Walking into a restaurant--and waiting to be "seeded." Ha! A little chicken humor for you. 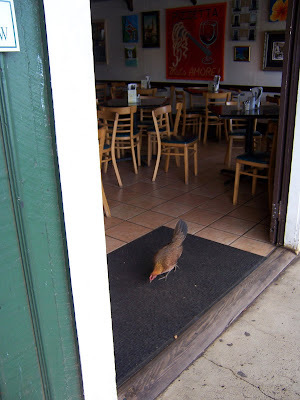 Actually, that's a pretty brave little hen--they serve chicken here! 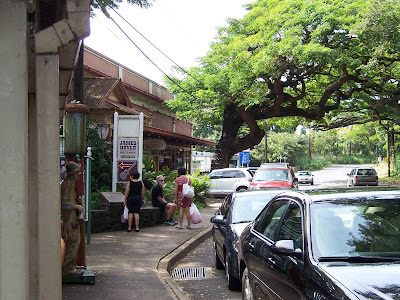 The large monkeypod trees are what gives Koloa its distinctive look. These trees are old and seriously BIG. Tragically, a developer cut down many of them last year to put in some sort of building development. As you can imagine, there was a huge public outcry. It makes me sad to think about it. Fortunately, they left a number of them for us to enjoy. They're so cute! What do you think, fifties or sixties vintage? I love them. 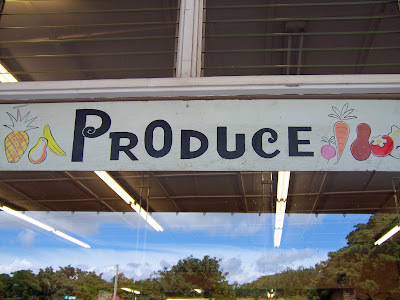 These wonderful signs are in the front windows of Sueoka's grocery store. The stone building is very cool. We'll run in and get some ice cold drinks. It's about 75 degrees now and very comfortable outside. 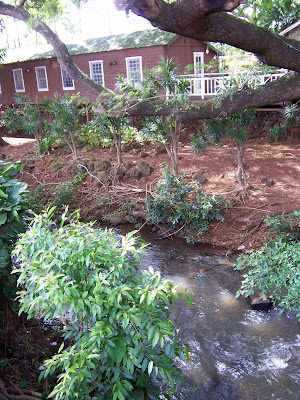 Koloa was the site of the first first sugar plantation in the Hawaiian Islands. 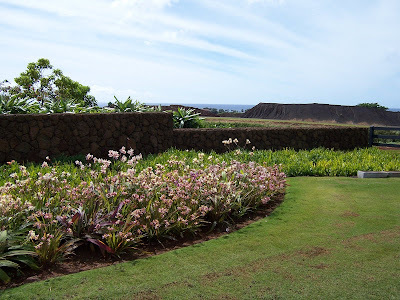 King Kamehameha III leased the land to Duncan McBryde in 1835 for his sugar operation. 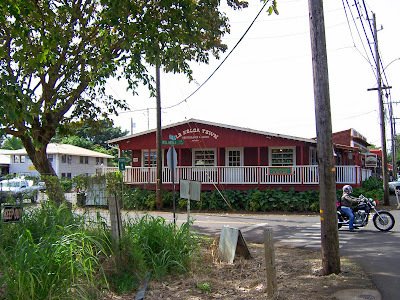 Many of these buildings are original plantation buildings. We pass over a bridge on our way to the rest of the town. See how red our dirt is? You have to use rust remover to get red dirt stains out of your clothing. 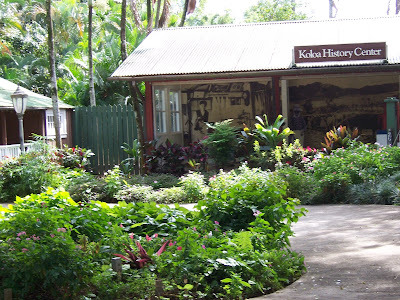 The Koloa History Center. A tiny little museum, but there is an old sewing machine in it! 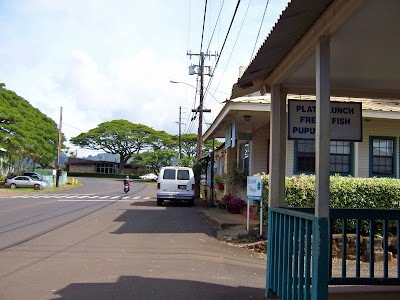 Continuing down the street and around the corner, there are lots of shops and shave ice stands. Oh look! Bikinis upstairs. Should I try on a bikini? Hmmm....let's ask Uncle Kimo. Looks like the thought of me in a bikini turned Uncle Kimo to stone. Harumph! Poor Uncle Kimo. He could use a bath. And an eyeball. (Do I look disgusted?) At least his dog loves him. 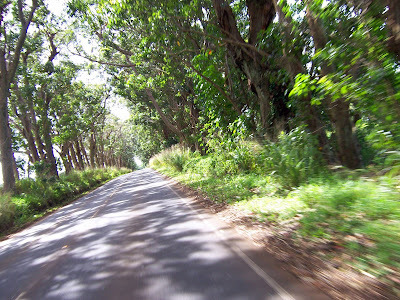 On my next post, we leave Koloa and head for Poipu. Uncle Kimo stays behind. On our way to Poipu! P.S. To all our Australian friends, our sincerest heartfelt sympathies for your terrible tragedy. To all the friends of our Aussie friends, please visit my sidebar where you will find a link to the Australian Red Cross. The Red Cross was so very good to us after Hurricane Iniki in 1992! I was able to see first hand all the good that this wonderful organization does in this kind of situation. Any donation, even a small one, helps. Mahalo Nui Loa. Welcome back! 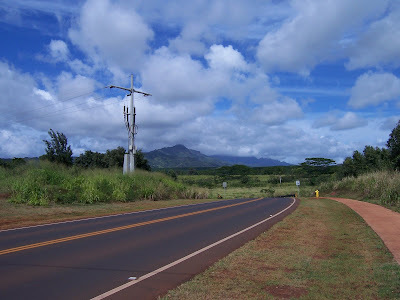 It's time to leave Kapaa and head toward Koloa. You ready? Good! The Spam with rice platter? How about Portugese Sausage with rice? No? 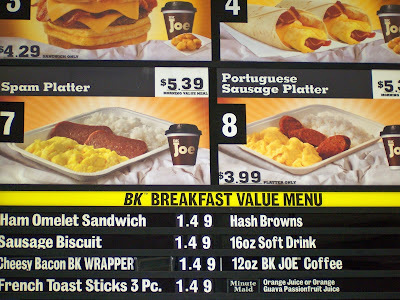 We have some local favorites that you might not find at Mainland Burger Kings. Our McDonald's here even has saimin! And taro pie! I'm just mentioning this. This is not an endorsement of said food. Don't come to Hawaii with false Spam expectations. It's still Spam, whether it's Hawaii Spam or not. 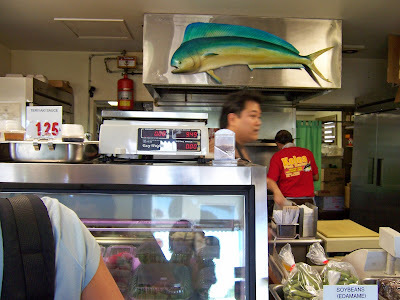 Did you know that Hawaii is the biggest consumer of Spam? People buy it by the flat here. They even make a kind of Spam sushi--a piece of Spam rolled up in rice and seaweed. I'm sure you'll want to try that...NOT! Unfortunately, Hurricane Iniki devastated the tunnel in 1992 and it's STILL growing back, even after all these years. The branches are just starting to touch in the middle again--I'm not sure how many decades more it will take to restore it to its former glory. I rolled down the window and stuck my arm out with my camera to take this picture. There's no good place to stop in the Tree Tunnel. Sorry about the motion blur! 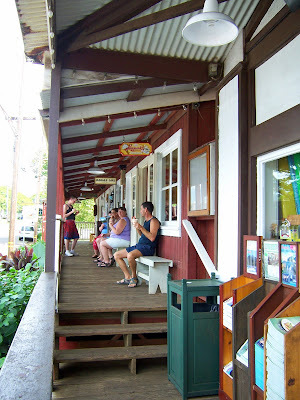 Here we are at Koloa Town! 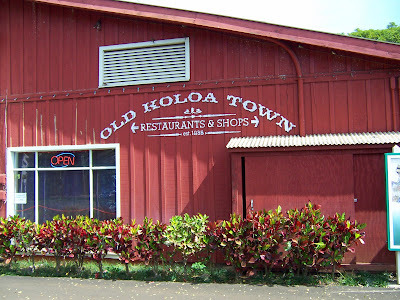 Old Koloa Town, that is. Let me see...it was established in 1935? 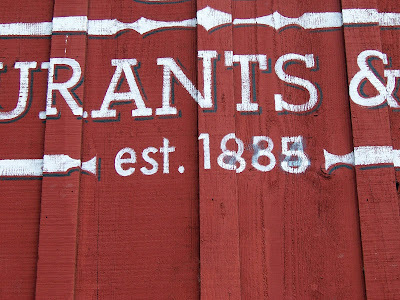 1885? 1924? Apparently, there is some debate about this. It looks like they let anyone with an opinion and a paintbrush have a go at it. Anyway...it's old. I LOVE this place. Holy cow, I love their seared ahi. 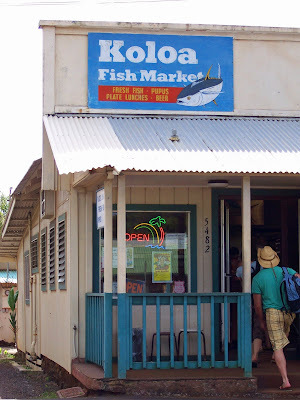 If I lived closer to Koloa, I would eat it every day. 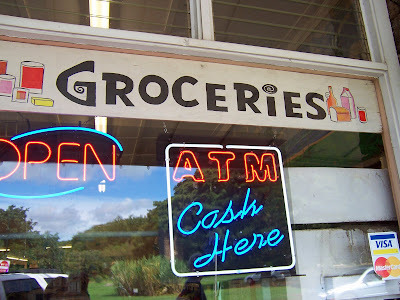 You can order from the deli window, or they'll prepare a fresh plate lunch on the grill back there. I love the color of that marlin back there! I don't know what color marlins really are (or is that a big tuna?? ), but "Marly" back there is one pretty fishy. 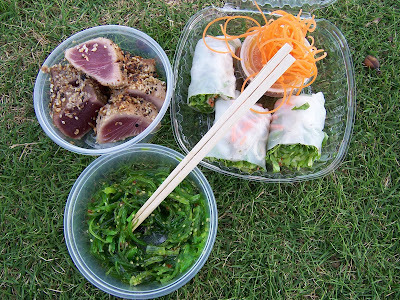 I get lots of Mainland people who used to live in Hawaii emailing me that they crave these foods so much! 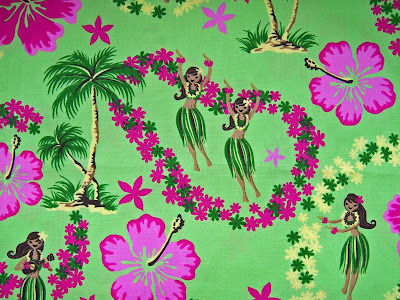 So...this picture is for you, ex-Hawaiians that now live in faraway places. 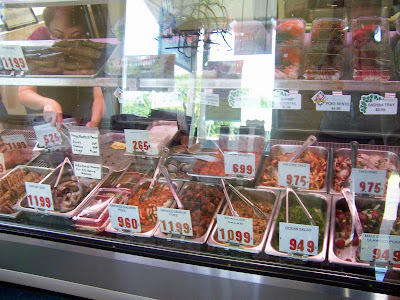 Enlarge the picture so you can see your pokes, sashimis, smoked marlin, tako. Happy drooling. For those of you who dislike seafood, proceed to the next picture. Well, maybe skip this one too. I meant to take a nice picture of these two as they are really nice people...but something happened to their faces when I whipped out my camera. See this? This is called "Stink Eye." Meaning that they didn't probably want their picture taken...but oh well, too late. When I told them why I was taking their picture, they smiled again...sort of. 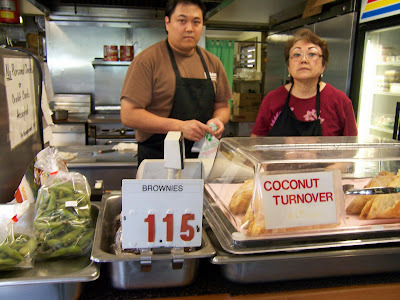 Maybe if I buy one of those coconut turnovers, they'll forgive me. Lots of shops! 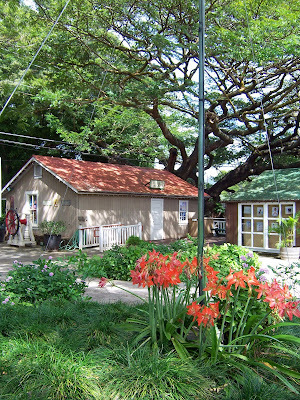 And DOWN the street: cafe, realtors, public library. UP the street we go. There are some nice shops and museums this way. 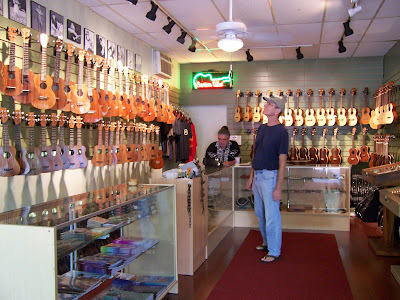 Clayton sees a ukulele store and MUST go in. It's sort of like a fabric shop for men, I guess. Except there's no fabric. Just a lot of different ukes. 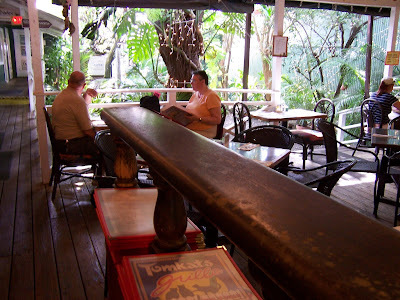 He can spend some time in here--I'll go out and sit on the porch with these happy people. Here it is, mid-winter, and they're in shorts eating Lappert's ice cream outside! They probably flew in from somewhere really, really cold--and this is heaven for them. Sitting on the porch and eating ice cream is nice, but my idea of heaven is a little bit different. 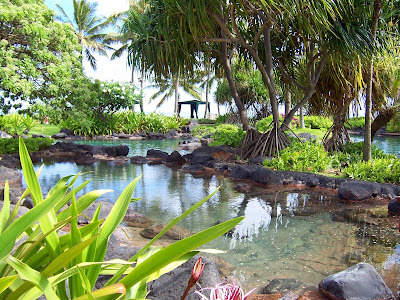 A Little Hawaiian Vacation, Anyone?